I recently finished reading Weird Places in Saskatchewan and Manitoba by Glenda MacFarlane. It's an entertaining exploration of geologic and cultural oddities to be found in both prairie provinces, hence its massive 10,000 page count. In all seriousness though, there are plenty of intriguing places that I would now like to visit such as Little Manitou Lake (which is saltier than the Dead Sea), the Great Wall of Smiley (visible from space) and the world's largest pair of underwear, which thankfully don't have my name sewn in them. I plan on chronicling my discoveries on this very blog. First off, the shopping centre that time forgot: Market Mall in Saskatoon. My favorite non-Wii related sport is miniature golf, so it was with great excitement that I made my way to Market Mall on Preston Avenue for an after-hours office shindig consisting of miniature pencils and multi-coloured balls. From the outside, Market Mall appeared to be bustling. There were plenty of vehicles in the lot and enough anchor stores (Safeway, Zellers) to give the illusion of economic prosperity. 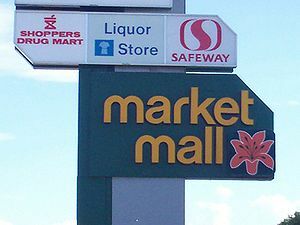 Upon setting foot within it's hallowed corridors, however, I realized that Market Mall in Saskatoon is no different than Fort Richmond Plaza in Winnipeg (coincidentally also with anchor stores Safeway and Zellers); an un-ironic throwback to the 80s...or as one co-worker coined it, the place "where dreams go to die". As I arrived early for our tee time, I passed the time by people-watching. The elusive dodo bird made an appearance before a living, breathing soul did, however, the dead silence was eventually interrupted by the sound of motorized scooters transporting the elderly from Hoffer Denture Clinic to the Ex-Cell Hearing Centre. The mall seemed to cater to seniors, as these were the only stores that were open at 6:30pm on a Wednesday night. Well, Boutique of Leathers was also open for business, but I'm trying to block the mental image of anyone over 60 ANYONE wearing chaps. Just...no. At 6:55pm (and not a moment too soon), my compatriots arrived and it was time for a tournament. 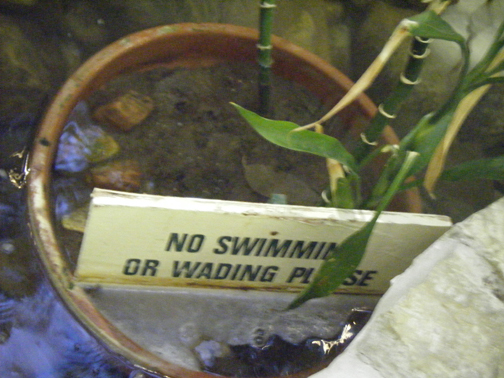 Actually, coins don't kill fish. People kill fish (because they are tasty). CANNONBALL - I'm totally bringing floaties next time I head to Market Mall! Which may be soon, as I am homesick and if there's anything here to remind me of Winnipeg, it would be a mall with empty storefronts and the stagnant smell of mothballs in the air. By the end of the night, I managed to score two hole-in-ones but the real achievement was making it out alive. Yes, I survived Market Mall: Saskatoon's answer to the Bermuda Triangle.